pianoSonoma Boston is a festival that promotes the development of young professional musicians (Artists in Residence) through leadership training and mentoring responsibilities while inspiring dedicated adult musicians of all backgrounds to engage more actively with their art form through private coachings, chamber music workshops, and public performances. 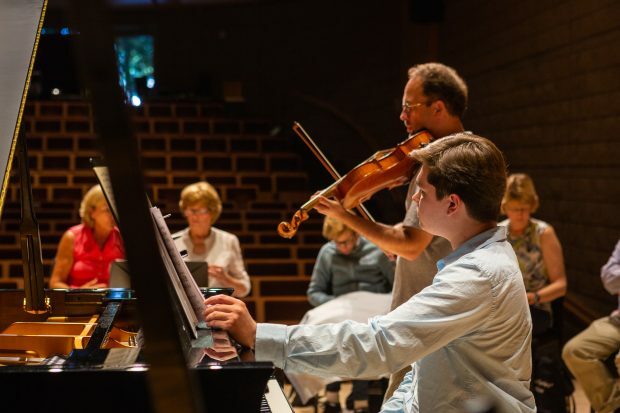 The festival cultivates an active artistic community, encouraging both these Artists in Residence and program participants to develop collaborative relationships which will carry well beyond pianoSonoma. This emphasis on a collaborative chamber atmosphere along with the festival’s dedication to community outreach invites musicians and audience members alike to enjoy classical music as a shared artistic experience. Please join us for the first pianoSonoma Boston in May 2019. The festival will be hosted by the Boston Conservatory at Berklee with lessons, coachings, classes, and performances all taking place at BCB. Our program is open to adult musicians of all levels and backgrounds. You will receive three 45-minute private lessons with faculty members and Artists in Residence. These lessons will be tailored to fit your needs and wishes. We encourage participants to bring already-polished repertoire for our many performance opportunities, as well as new pieces. We offer a unique opportunity for you to collaborate with one of our Artist in Residence musicians. You will receive three 45-minute guided rehearsals with one of our gifted fellows. These will be in-depth duo rehearsals, so please come prepared for a rich, musical immersion. We will have performance classes led by pianoSonoma faculty and guest artists. One of the highlights of our festival is that we provide a supportive, intimate, and private environment for you to conquer performance anxiety and to experience the reward of sharing your passion for music on stage. You are welcome to perform a solo or a duo selection (no more than ten minutes in duration) for our final participant concert. In addition to joining you for the final concert, pianoSonoma faculty and Artists in Residence will perform in an opening concert. Tuition includes a welcoming breakfast, the reception before the Final Participant Recital, and catered lunches Tuesday-Friday. It does not include housing and additional meals. Upon acceptance to our program, a deposit of $850 is required to reserve your place. This sum will be put towards your full tuition. Our program is geared towards deep musical exploration. As such, we ask that you prepare and focus on one short piece or one movement of a larger work with your Artist in Residence in guided rehearsals. Rest assured, your selection will be chosen carefully in consultation with you, our Artistic Directors, and assigned Artist in Residence so that you feel completely comfortable with the repertoire. Of course, please feel free to bring multiple solo works. Please include your musical background and current teacher if you have one. Please submit audio / video recordings of two contrasting pieces of your choice. pianoSonoma prides itself on presenting each participant with an individualized program of study that is built around the participant’s strengths, both musically and personally. Your commitment to our festival is the catalyst for our decision-making process: how many Artists in Residence will be accepted, which repertoire will be played, and which venues are booked. Because of this, we cannot offer any refunds once your deposit is submitted. We appreciate your understanding.